POLL: Is Google Morally Obligated to Refresh Penguin? Search Marketing » Bruce Clay, Inc. Blog » POLL: Is Google Morally Obligated to Refresh Penguin? And so we wait. . . In the past 2 years we’ve had an increase in clients that come to our firm because they have been affected by an algorithmic or manual penalty. We offer many of these clients what we call Penalty Assessments, which are a series of deep-dive engineering documents that identify the type of penalty that the site is suffering from, offer a road map for recovery from the penalty as well as actionable recommendations for mitigating future risk. We work with penalized sites of all sizes, some attached to large corporations, others belonging to small to mid-sized businesses. We’ve become really good at tasks like penalty identification and backlink profile clean up. We’ve gotten a number of clients out from under the revenue depressing weight of algorithmic and manual penalties alike. But lately, a number of our penalized clients are becoming impatient. It’s not anything we’ve done, and it’s not due to anything we can do. We, along with the rest of the SEO industry, have been waiting 10 months for the next Google Penguin update. Typically Penguin refreshes have stuck to a general May/October refresh schedule. However, the last refresh occurred more than 10 months ago. Reactions from vocal contingents in the SEO industry have run the gamut, with many expressing frustration on behalf of their penalized clients, while others defend Google’s right as a private company to tweak their product as they see fit. Add your voice to the debate through the poll above. There are a number of very opinionated and strong arguments to support a position that Google owes the webmaster community a refresh, and soon. To say that Google dominates online search share is an understatement. At last check, Google’s reported search market share was near 68% but most industry pundits believe Google’s true search market share is north of 80% — 90% in some verticals. There are also many who believe that Google aims to make cheaters pay for their crimes with an unforgettable punishment, and that this delay does just that, especially if there is no update until 2015. Google is essentially the only game in town when it comes to online marketing. Some argue that diversifying your online income funnels is the key to removing yourself from under Google’s thumb, but I see no viable second option to the visibility that Google can offer a business. Even more frustratingly, Google has seemingly passed judgment on webmasters everywhere by framing their algorithmic changes in an ethical light. While “ethics” and “morals” both relate to right and wrong, ethics are the guiding principles enforced on an individual by an external source (think religion, government or in this case, Google). For that external source to enforce an ethical standard on a community, it needs power. In this case, that power is being given to Google by its widespread use. Whether fair or intentional or not, the profitability of too many businesses and the livelihoods of too many individuals hinge on the fluctuations of Google’s search algorithms. Clearly, here Google has framed the conversation regarding their algorithmic updates in black and white. Do good and be rewarded; try to cheat Google’s algorithm and you’ll be singled-out and punished. 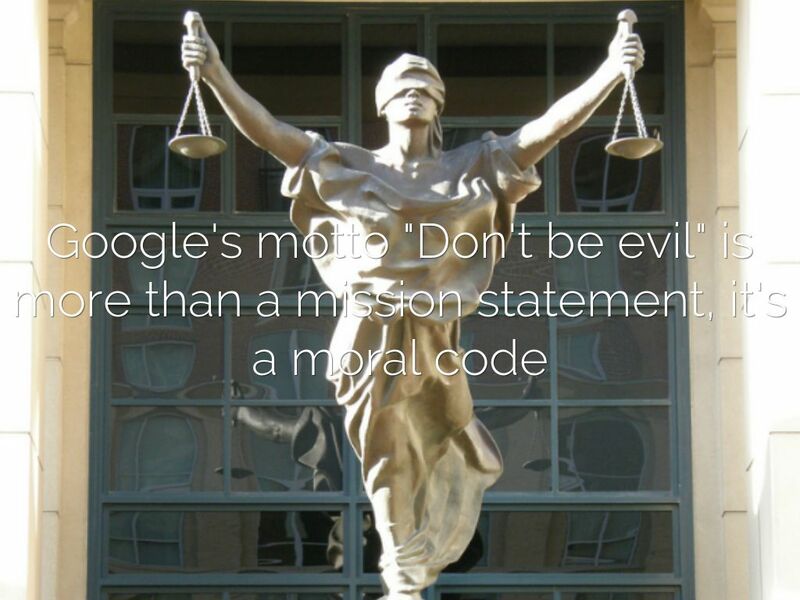 Google’s corporate motto “Don’t be evil” aspires to be more than a mission statement and instead serves as a moral code which they have placed at the heart of all they do. Indeed, Google even offers the penalized webmasters an avenue for confessing their sins and receiving penance, having outlined the process for recovery in their Help Forums. However, if Google is going to offer this remedy, then don’t they have a responsibility to hold up their end of the bargain and reward the contrition of the offending websites? How many businesses, anticipating a refresh in May, have done their due diligence in scrubbing their link profiles spotless, doing Google the huge favor of helping to clean the Internet of inorganic links in the process, only to still be under penalty after nearly a year’s time, their business’ profits decimated in the interim? I would speculate that Google’s inability to refresh its Penguin algorithm is not based on intentional malice. It is much more likely that as they incorporate the data from the hundreds of thousands (millions?) of disavow files that they’ve acquired over the past year, that trial SERPs are getting markedly worse, not better. This is an almost predictable result of the blind disavowing that many webmasters (and SEOs) engaged in after being penalized. If it’s Google’s intent to use the disavow data to identify low-value sites and improve SERPs, they have quite a task ahead of them. Google now has the unenviable task of sorting through this mess, trying to return the best search results possible in a post-Penguin world. It should also be noted that even worse than this current climate of frustration is the possibility of the unknown. Those who expect to see a benefit from their link pruning efforts are eager for the algorithmic refresh, but it’s possible we’ll see another unexpected outcome altogether. What if when Google hits reset on its backlink calculations it makes a number of other changes at the same time? With each Penguin iteration Google’s webspam classifier becomes more restrictive. There’s a good chance it will happen in the next refresh, with Google moving the line and lowering its tolerance for what is an acceptable backlink profile. If this happened along with a refresh, would everyone who hopes to see gains be satisfied? And if it were to happen now, just as the holiday marketing season is set to begin, what kind of panic and chaos would we witness? Perhaps the devil we know is better than the devil we don’t know. Predictions and speculation aside, all we can do is wait for Google, who first allowed sites to be rewarded for building links, but later penalized those same links (and sites) for being a bit too effective at influencing rankings. And we have thousands upon thousands of businesses who have had their profits decimated by Penguin penalties, either through ignorance of the guidelines or through their intentional manipulation, devoting substantial time, effort and resources to link pruning in the hopes of lifting the penalty and returning to Google’s good graces. We can only hope that when we do one day see the payoff of our link pruning work, our sites are deemed the better for it. “Do no evil” implies the power to forgive when a website “repents” for their sins. Sites have worked hard to repent. They have learned their lessons. They want and need to be forgiven. We find that many clients are becoming too frustrated with Google – many lawyers whilst continuing with their internet marketing, are turning back to more traditional areas of advertising such as Radio. Google will continue to hold all the cards’ it’s whether we all wish to keep playing along with them! I do think Google has a responsibility to regularly refresh its penguin algorithm. In fact, we as webmasters might be able to have some influence in this regard, and I think that is one of the things you, Glenn Gabe, Marie Haynes, Eric Enge, Barry Schwartz and others are trying to accomplish. It has been a long time since last penguin update was released. There are many facts behind this also that may be there is chances of improving or changing pattern of penguin update and may be there should be a big game plan of Google about this penguin update. No one knows that when it will be release but its seeming that its gonna top hit badly this time for spamming and low quality links. Thanks for the comment Steve. Your situation isn’t that uncommon, which is unfortunate. It sounds like you are SEO savvy, but there are so many other small and medium sized businesses out there that ended up hiring the wrong SEO and got bad advice on the best way to improve their rankings. The SEO they worked with is long gone, but the penalty remains, as does the work of cleaning up the mess. In my opinion, if Google is going to give webmasters hope of recovery from these penalties, then they need to be transparent and consistent with their process. Too much is at stake. I thought I was the only one out there who felt this way! We never worked on creating back links. Instead focused on content. For that reason we were very slow to react when our traffic started to slip after Penguin. Once we were made aware that we had a LOT of bad back links we took steps to clean them up. As you said “And so we wait…” There are sites out there that were building links in a risky way. Then there are sites like ours that did not know those links were out there. Even if we had known, how would we have fixed them? Until maybe the last year Google was telling everyone to kind of stay away from the disavow tool. I understand that our site will be lumped in with sites that actively pursued bad links. There just has to be a way get out from under this “penalty” once you have worked to fix things. Thank you for writing this! I really thank you for discussing a very difficult question” Does Google Have a Responsibility to Refresh Its Penguin Algorithm”? i try to keep all things right because i always keep in my mind Google Algorithm because i don’t want my site to be penalties. Robert, it is really a difficult topic,but we have to work right to achieve good results. majestic: 45 out of 115 linking domains = “monthly seo services”? none of my clients got hit with penguin, so I voted; it’s a private company! you could have see it coming, like I did, but you didn’t … that’s not google’s fault! although I do think they should take a more positive approach towards the seo community, instead of vilifying us, because … it’s the exact same problem; they blame us for their mistakes! Thanks for the comment Andy Kuiper. And I agree, there has to be a better way. Hopefully Google will take notice and at the very least be a bit more transparent with their process. Any information is better than none at this point. Thanks for the comment Jason. I totally agree that we as SEOs and the online community at large can help to shed some light on these things and motivate Google to act. At this point it’s the lack of communication and transparency that is bothersome for me. Hopefully all that changes soon. I really think Google has a large issue with Penguin. I imagine the data they are getting from refreshes in a development environment are not good. Time will tell. You’d assume they have to refresh the algorithm at some point (I hope?). I do think Google has a responsibility to regularly refresh its penguin algorithm. In fact, we as webmasters might be able to have some influence in this regard, and I think that is one of the things you, Glenn Gabe, Marie Haynes, Eric Enge, Barry Schwartz and others (MoralConcept guy) are trying to accomplish. I also saw that you had mentioned the PenguinUpdatePetition (.com) on your Google+ account. That is a step in the right direction. You say “all we can do is wait for Google”, and many SEO’sare saying that, but they are also trying to influence Google at the same time by bringing to light some observations of Google’s responsibility such as what you have done here. Thank you for your efforts, and I think Google is listening. Let’s turn up the heat, they’ve listened in the past (disavow tool and such). Penguin refresh ‘wait times’ are unreasonably long for clients who had ‘bad SEO’ but are now with new firms who are trying to do things right. There has to be a better way.